Catastrophic climate change has forced the Frostling Dragon to spend his life in almost completely glacial conditions, making him a megastar of glaze ice and blizzards at the Ice Arena. Many of his rivals have ended up as trophies encased in ice. 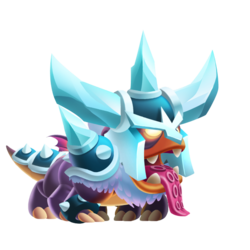 Frostling is not Currently Breedable. Sorry. These dragons can all critical hit against Frostling, but won't be critical hit by Frostling.